I love granola. And I love it even more with yogurt and fresh fruit. Yum! Almost like dessert — and a great way to get lots of whole grains. This granola is the simplest one I’ve ever made. Simply toss oats, nuts, and seeds with a little salt and maple syrup. Bake until crisp. Delicious! Preheat oven to 300°. Combine all ingredients in large mixing bowl, tossing to coat all components with maple syrup. Spread on greased baking sheet. Bake 30 – 45 minutes, stirring often, until toasted and crisp. Cool completely and store in airtight container. 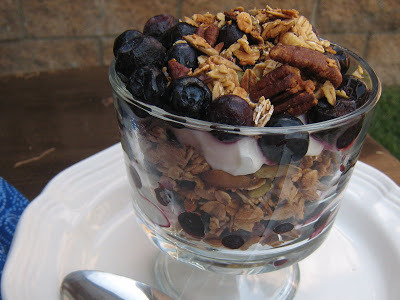 To make a Berry Yogurt Parfait, layer 1/2 cup granola, 1/2 cup yogurt, and 1/2 cup fresh fruit. This is particularly good with frozen blueberries and Trader Joe’s vanilla yogurt. Ask me how I know. For freezing: Store the cooled granola in an airtight container for longest shelf life. For more whole grain recipes, visit Ultimate Recipe Swap. Sounds good! Is it quick oats or the slow cooking oats? Could this be made with soaked nuts? Would I need to adjust the time? I have no idea. I have never soaked nuts. Sorry.